Our Executive Weekend Programme is designed for those with very busy work schedules but who want face-to-face tuition. Modules are spread over 24 months, allowing you to choose your pace of study, and are held on one full weekend per module, with some modules requiring an additional Saturday. Classes run on both Saturday and Sunday of the scheduled weekend. They start at 9.30am and conclude at 5pm and are available in Cambridge. As a guide, in addition to your taught sessions, you should allow between 8 and 10 hours for home study over 12 weeks for each module for the duration of your course. Loved the course, the materials and weekend sessions were fantastic. The tutor was great in engaging us and giving us confidence about the syllabus and being able to succeed. The weekend was really enjoyable and helpful. Great support! I just wanted to drop a quick thank you to you all for helping me to complete my CAM Diploma in Marketing Communications. I thought all the study weekends and the organisation of the course were excellent and have found that it has already been hugely influential on my current employment and my future career plans. 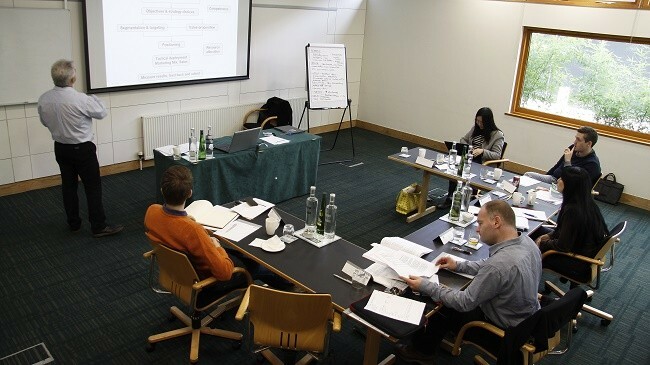 Taking on the CAM Diploma through the executive weekend programme was indeed challenging but I received so much help and support from Cambridge Marketing College. Our weekends provided a great opportunity to meet likeminded individuals and build relationships which helped carry me forward through my coursework and exams. The tutors gave inspiring examples of their own experiences in the marketing industry and they were always on hand to give feedback, help and advice. I thought the weekend working was excellent and enabled me to do a full time job and study. Excellent weekend session. The tutor really gets the group talking and engaging in relevant, informative debate/discussion. I really felt I learned a lot from the session and am able to prepare for the exam. It was a very well taught course. The teacher is well informed and inspiring. The slides were great, the lesson format worked very well for the group.